Found at Lady Heyes for 50 pence. For hanging on walls - PORCELAIN, CHINA AND GLASS PLATES AND PLAQUES. 1.Before fixing,check position of disc so that any design on plate will hang upright. 2.Apply a small amount of water to the disc. With the fingers, work this into the glue until it is throughly wetted right down to the cloth and the glue becomes opaque. 3.Leave the disc for 5 minutes for the glue to become tacky. 4.Apply disc to plate . Press down firmly, at first with fingers, the with back of spoon. 5.Allow to harden overnight before hanging. Not recommended for metal plates. These hangers are perfectly safe if applied correctly. It is important that the disc is pressed down firmly and for a sufficient length of time so that the Disc shows no tendency to rise from the plate. 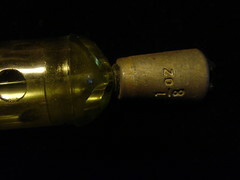 Small glass tube full of different size needles for a gramaphone. TURN POINTER ON CAP OF TUBE TO KIND REQUIRED AND SHAKE THROUGH HOLE. 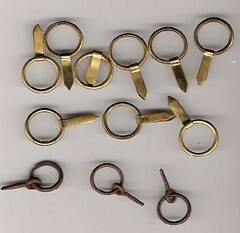 Collection of fishing lures with weights of various sizes. 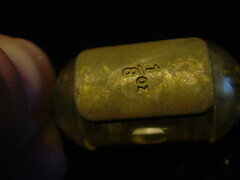 Close up of one eight of an ounce weight. 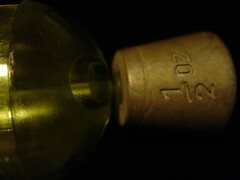 Close up of one eighth of an ounce weight. Close up of half ounce weight. 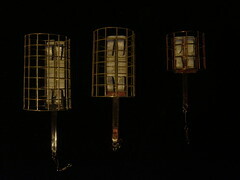 Set of 3 Cage Feeders, used for fishing. Donated to the collections by Tony Eve. 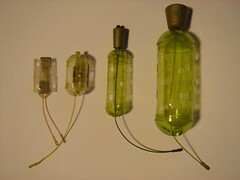 The base is an oblong lead weight. 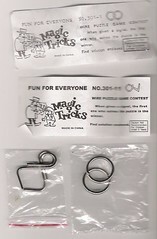 There is a hole at the end to attach a fishing line. 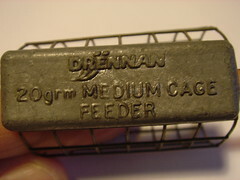 Drennan 20grm Medium Cage Feeder. 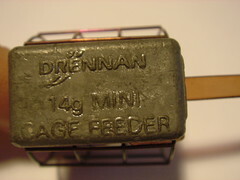 Drennan 14g Mini Cage Feeder. 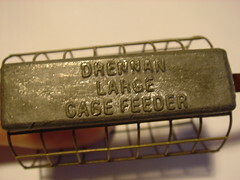 Base of Drennan Large Cage Feeder. I don't really like the idea of trapping small creatures in such a vicious way...but I do love the design of the objects people make to do it. 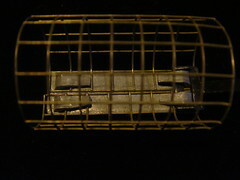 This Metal trap has a very cheap stamped out design. 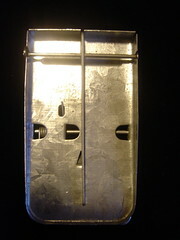 Even the "cheese" holder is a triangle cut from the base and bent out. 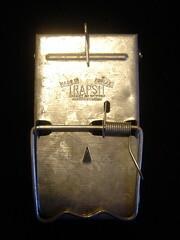 The underneath of the trap showing the simple yet deadley design. 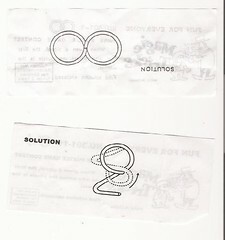 The Instructions are so well written. A great and unusual find. Hold Pointer firmly in left hand and mechanical pencil, with lead set forward not less than 3/4 inch and locked in position, in right hand. 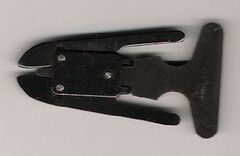 Insert lead in Pointer's top opening and rotate back and forth to obtain point desired. See sketch below. 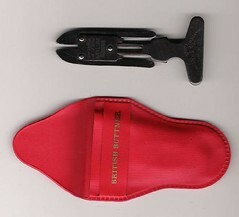 The cap of the pointer unscrews to permit the removal of accumulated lead dust when necessary. The rubber suction cup base secures the pointer to desk or drawing board for convenient access. 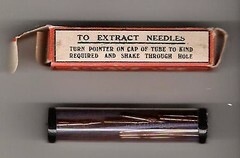 If lead should break inside Pointer remove cap and dislodge with pin or other sharp instrument. Always use finest quality leads for maximum satisfaction and economy. 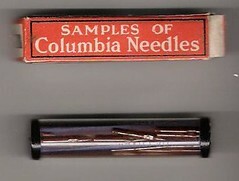 The Push-Button Pencil with The DOUBLE-ACTION Clutch. ...grips the lead firmly and holds it securely. . . the LEADLOCK is all-metal, light weight and perfectly balanced, incomparably constructed . . . unbelievably priced! 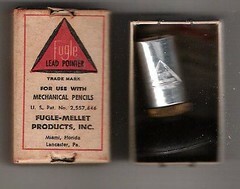 A lifetime companion to the Fugle LEAD POINTER. Colored top buttons designate degrees of lead hardness at a glance. The Fugle Lead pointer is a precision instrument of the highest quality designed to point and repoint quickly, cleanly, conveniently and perfectly the leads used in mechanical pencils, compasses, lettering sets, etc. It is constructed to provide the utmost in performance and durability to meet the requirements of draftsmen, artists, engineers, architects, photo retouchers, accountants, bookkeepers, students and others whose work demands the ready availability of perfectly pointed leads. This Pipe Reamer is manufactured from specially selected Sheffield Steel and the blades are hardened to prevent damage and to give maximum efficiency. The Edge cutters are hollow ground and the Reamer is completely rust proof and the cutters guaranteed not to chip in use. 1. The Reamer must be at its minimum when inserted into the bowl. 2. The Reamer must be inserted at an angle of 90" and maintained at such an angle. 3. Rotate the Reamer in both directions until the blades are cutting smoothly into the carbon wall, using light firm pressure. 4. Continue until the desired thickness of carbon wall is obtained. 5. Great care must be taken where the carbon deposit is lumpy .the Reamer must not be forced but gently rotated in both directions until the lumps are removed. 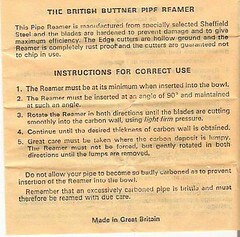 Do not allow your pipe to become so badly carboned as to prevent insertion of the reamer into the bowl. Remember that an excessively carboned pipe in brittle and must therefore be reamed with due care. When given a signal the first one who solves the puzzle is the winner. CAUTION Not Recommended For Children Under 3 years. Passe-Partout was very popular in England just after WW2. My old neighbough,Mr Ringrose, had one of those wonderful sheds full of labelled drawers. I still have the 10 yards swimming certifiacte he kindly framed for me using Passe-Partout. (you layer card,picture,glass and then tape arounf the edges with special tape..remembering to attach a hanger before you do. There were a mixture of items in the box. 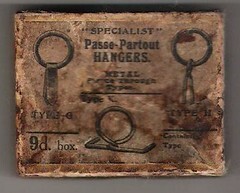 The bottom three being screw in hangers and the top ones being the fold back hangers for use in Passe-partout.